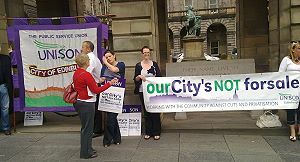 Reports suggest Edinburgh Council will vote against two huge privatisation plans today. We will wait for the actual vote before celebrating but this could be great news on top of the decision to keep the environment contract in house last November. Firstly because we think it is the right thing to do. We think it is right that quality public services are delivered by a public service team directly accountable to the people of Edinburgh through their elected councillors. We think it is right that our taxes should go directly to services, to the people who deliver them and the people who rely on them, rather than to profits and shareholders. Secondly because we believe that the public sector comparators – the in house options – have risen to the challenge and will deliver not only best value but a continuing commitment to public services in Edinburgh. And thirdly because we believe that it is right that the Council should show trust, confidence and respect in its own workforce. At the beginning of this process, the Council made it clear that there would have to be a compelling case for privatisation. We clearly believe that a compelling case has NOT been made for privatisation and we believe we have consistently provided compelling and credible analysis and evidence to show that. The unions and your employees have put enormous work into this process. We have shown in detail that the in house options have been realistic, fair and efficient – but most of all workable – especially if we have a level playing field and like is compared with like. We have exposed doubtful comparisons and we have been honest about what our members have done and will have to do to deliver. Some of our members, especially in the environment stream, have had to swallow bitter pills to get here. But they have been prepared to do that because of a commitment to the service and a belief that, with change, their voices will begin to be heard. UNISON has said for years that the people who know best how to improve services are those actually delivering them on the front line. They need to be heard and that has not always happened through this process. But there are high hopes from our members that it will happen and continue to happen into the future. Because that is the way to get fairness, quality and efficiency.